On August 25, 2012, the Ukrainian Historical and Educational Center celebrated 22 years of Ukrainian independence with a concert of music and dance. After a standing-ovation performance last year, the Washington, DC-based ensemble Gerdan, lead by classical and folk flute virtuoso Andrei Pidkivka and violinist Solomia Gorokhivsky was back for a return engagement, along with dancers Roman Mykyta and Colleen Prince. 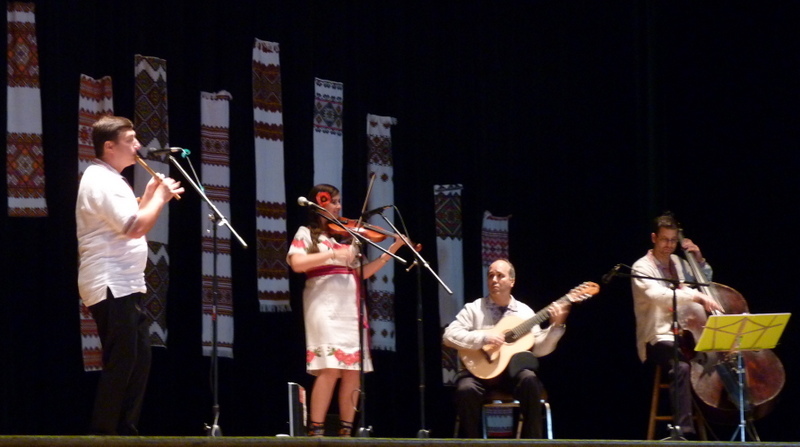 Gerdan did a phenomenal job (as usual) with their inimitable combination of East European folk melodies, jazz, and world music influences, while the teen-aged dancers also gave a fantastic performance of their own choreography that combined classical ballet and folk dance. We look forward to much more great work from these young dancers in the future! The program opened with an invocation by Metropolitan Antony, and also included greetings by Vice Consul Konstantyn Vorona from the Ukrainian Consulate in New York City and reminiscences by V. Rev. John Lyszyk. Photographs courtesy of Kathy Park.